Co. Roscommon: Athleague, Fuerty, Clonfinlough (2), Cloontuskert, Cloonygormican, Elphin, Kilbride, Kilgefin, Killukin, Kilteevan, Kiltrustan (2), Knockcroghery, Lissonuffy, Roscommon (3), Strokestown (2), Tulsk. Co. Roscommon and Co. Galway: Dunamon. The Board also included 7 ex-officio Guardians, making a total of 30. The Guardians met each week on Saturday at noon. The population falling within the Union at the 1831 census had been 80,608 with divisions ranging in size from Kilteevan (population 2,614) to Roscommon itself (9,316). 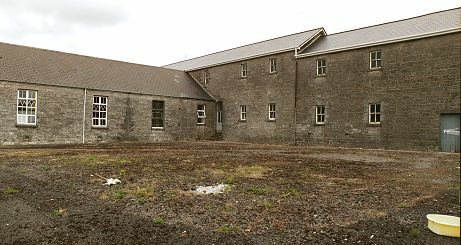 The new Roscommon Union workhouse was erected in 1840-2 on a 7.5-acre site half a mile to the south of Roscommon. Designed by the Poor Law Commissioners' architect George Wilkinson, the building was based on one of his standard plans to accommodate 900 inmates. Its construction cost £7,500 plus £1,488 for fittings etc. The workhouse was declared fit for the reception of paupers on 5th October 1842 and received its first admissions on the 4th November 1843. The workhouse site location and layout are shown on the 1910 OS map below. 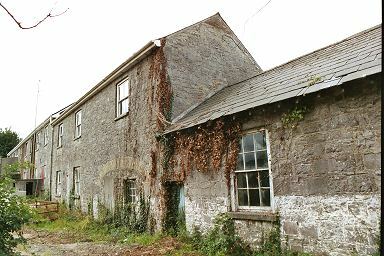 Roscommon workhouse site from the south-west, 2003. The buildings followed Wilkinson's typical layout. An entrance and administrative block at the west contained a porter's room and waiting room at the centre with the Guardians' board room on the first floor above. The wings at each end provided separate boys' and girls' school accommodation. 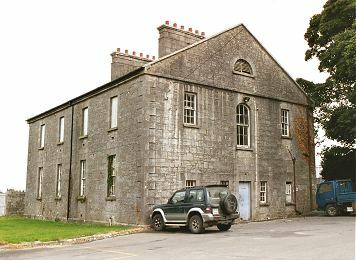 Roscommon entrance block from the south-west, 2003. 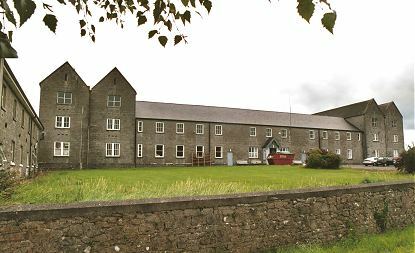 Roscommon main block from the west, 2003. Roscommon chapel and infirmary from the south-west, 2003. Roscommon rear of infirmary block from the north, 2003. During the famine in the mid-1840s, a 40-bed fever hospital was erected at the north of the site. A house was was hired to accommodate fever patients, and stables fitted up for the reception of patients. 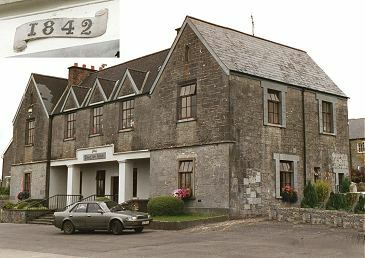 Roscommon fever hospital from the south-west, 2003. 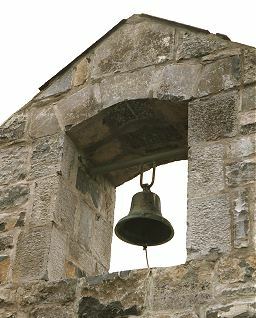 The workhouse inmates' day was governed by the workhouse bell. In summer, they rose at 6am and worked until 6pm. In winter, they rose at 7am and worked till 5pm. In 1852, the northern part of the Roscommon Union went to form part of the new Strokestown Union. Most of the original buildings survive in the form of the Roscommon's Sacred Heart Hospital which provides care services for the elderly. 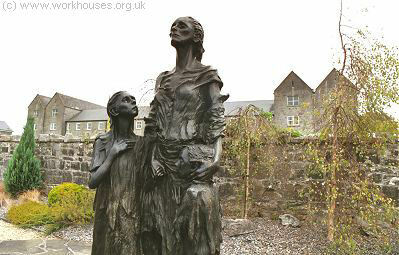 A memorial to those who died during the great famine stands at the front of the site.